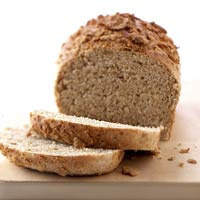 This healthy bread is loaded with whole grains and is delicious for sandwiches or toast. Place bulgur in a small bowl. Add boiling water to cover. Let stand 15 minutes; drain well. Meanwhile, in large mixing bowl combine 2 cups of the all-purpose flour and the yeast; set aside. In medium saucepan heat milk, honey, butter, and salt just until warm (120 degree F to 130 degree F) and butter almost melts. Add milk mixture to flour mixture. Add egg. Beat with an electric mixer on low to medium speed for 30 seconds, scraping sides of bowl constantly. Beat on high speed for 3 minutes. Using a wooden spoon, stir in the bulgur, remaining all-purpose flour, 1 cup of the whole wheat flour, oats, cereal flakes, and wheat germ. Turn dough out onto a lightly floured surface. Knead in enough of the remaining whole wheat flour to make a moderately stiff dough that is smooth and elastic (6 to 8 minutes total). Shape dough into a ball. Place in a lightly greased bowl, turning once to grease surface of dough. Cover; let rise in a warm place until double in size (about 1 hour). Punch dough down. Turn dough out onto a lightly floured surface; divide in half. Cover; let rest 10 minutes. Meanwhile, lightly grease two 8x4x2-inch loaf pans. Shape dough into 2 loaves; place in prepared pans. In small bowl combine egg white and 1 tablespoon water. Brush loaf tops with egg white mixture; sprinkle with coarsely crushed cereal. Cover; let rise in a warm place until nearly double (about 30 minutes). Preheat oven to 375 degree F. Bake for 30 minutes or until loaves sound hollow when lightly tapped. If desired, cover tops of loaves with foil the last 10 minutes of baking to prevent overbrowning. Remove from pans; cool on wire racks. Makes 2 loaves. Calories 134, Total Fat 3 g, Saturated Fat 2 g, Monounsaturated Fat 1 g, Polyunsaturated Fat 0 g, Cholesterol 15 mg, Sodium 136 mg, Carbohydrate 23 g, Total Sugar 4 g, Fiber 2 g, Protein 4 g. Daily Values: Vitamin A 0%, Vitamin C 3%, Calcium 3%, Iron 10%. This entry was posted on 10:00 PM and is filed under Bread . You can follow any responses to this entry through the RSS 2.0 feed. You can leave a response, or trackback from your own site.